The sparkling sea blue on the Navy mom personalized Christmas ornament is one of its wonderful features. Nicely reproduced from a hand-carved design, these military ornaments personalized for the recipients are purchased and personalized by and for moms with kids serving our county in the US Navy. They include a display cord that makes them easy to hang virtually anywhere, and they arrive in our plush velvet gift and storage bag. 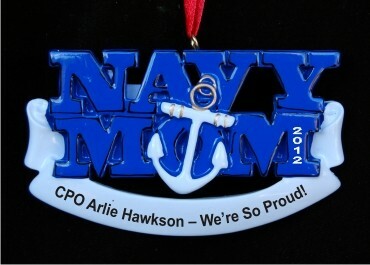 Show your pride in your son or daughter's service - or display your support for a mother whose child is away defending our security with the Navy mom Christmas ornament personalized for the mother of an American hero!